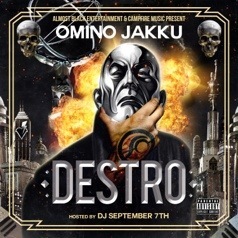 Miami, FL, June 28, 2013 – Coast 2 Coast Mixtapes announce the release of the “Destro” mixtape by Omino Jakku. The 14 track project, presented by Coast 2 Coast, is currently available for download. The mixtape is hosted by DJ September 7th of Cali Untouchables and Coast 2 Coast DJs. Omino Jakku is co-founder of Las Vegas’ largest hip-hop movement, Campfire Music which has over 40 members ranging from poets, DJs, and more. He was introduced to various music genres at an early age by his father, but didn’t find hip-hop until the early nineties. Influenced by Del the Funkee & the Hieroglyphics crew, A Tribe Called Quest, Redman, Michael Jackson, Mos Def, and more, he is determined to build a solid music career. He uses his unique sound and creativity to set himself apart from others. “Destro is an introspective look into the society we live in without the sugar coated censorship of the mainstream media or corporate music machines. It’s the idea of everyone wants to shine but is too hardheaded to succeed and get it,” says Omino Jakku. To date, Jakku has released several albums and produced tracks for many local and nationwide artists such as Mikey VIP, Mob Zombie, to Homeboy Sandman and more. He has also performed shows nationwide and has “The Hangover Tour” which hits 12 cities in August. The highly anticipated project “Destro” is available for download and streaming now. The mixtape takes listeners on a journey through Jakku’s past life experiences and how he has escaped the stresses of the world. He is currently working on his next album “Poorsche”.